Good luck! If I have time I might just come and join you in the challenge! haha they garnish it with peppers! Also I remember when I worked as a cook in Canada we'd try to best our co-workers by eating whatever spicy thing we could get our hands on. Usually ended in tears and vomit. Good times! Come on CO2, do it for Waygook! Shittttt, I just re-read it. I have to eat 3 damn cutlets AND a bowl of rice in 20 mins. Spice aside, that's a lot of food! I will do this for all waygooks who are incessantly asked, "Isn't it spicy?" So, did CO2 do it? Last... a Korean ramen you can buy at any corner store (of course no Korean ramen has ghost peppers) and the four Koreans are falling down and acting like it's the spiciest food in the world! I bet if any of them had taken one bite of an actual ghost pepper, they wouldn't have thought the Korean instant noodles was that spicy in comparison! 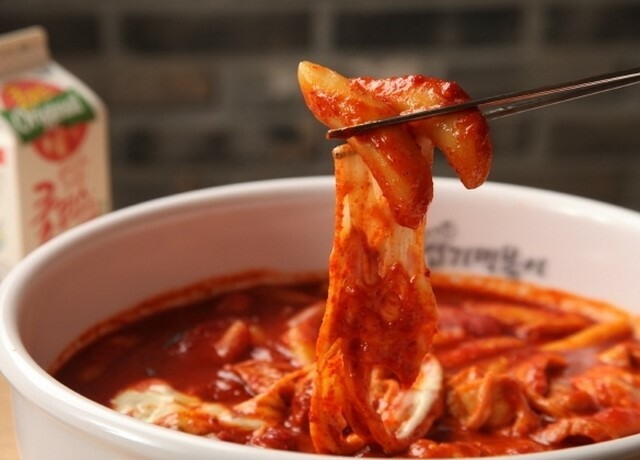 As for Korea, 엽기떡볶이's highest level of heat was the spiciest thing I've eaten here. Personally the spiciest thing I had ever eaten was when I went to a soup curry restaurant in Japan and ordered the highest level of spice, then bragging to my friends that it wasn't spicy, poured a ton of more red pepper into it. I managed to finish the entire thing. Ever since then I've never really pushed myself to do any spicy food challenges. I just enjoy spicy food for what it is... no need to brag, no one cares and it's okay to challenge yourself... but I've been there and I don't think I'll ever want to experience that limit again. I also ended up learning something: even if you are extremely good at handling spicy food, your stomach has its own limit. Absolutely, I can handle pain in my mouth, that's not really that bad. But the gurgling and nausea and upsetness in the stomach. F'in unbearable. Well, I've gone and topped myself. What do you mean? hahaha You like to see me in pain? I enjoy spicy food, but the pain thing... I’m a bit of a wimp. Bull Dawk(불덕) It's chunks of spicy marinated chicken with a hot spicy sauce on it. There used to be a place near the bar Woodstock in the Shinsheon area. There was alawys a big line up. They had iced cold beer. The beer just moved the spice around your mouth. Pretty much sums up the bite it has. I guess that's why it is easy to remember the name of the dish. Really good marketing by the company. Order some and we can do it together! At family gathering, we did 9 of the 10 bottles from FIRST WE FEAST (all but the last dab, as it wasn't available at the time). I just pre-ordered a bottle of it from heatonist, but it will take awhile before it arrives, as production is slow, and you are limited to only two bottles. Any of you tried any of them? I had a tablespoon of Blair's Mega Death back in high school. Had to run 3 blocks to a pharmacy to get pepto-bismol.